Method 1. Mix together the water and flour to form a paste and set aside. You’ll be using this to help seal up the pockets. 2. Place frying pan on stove, and add enough oil so that the pan is well coated and the oil is about an inch deep. Set to medium-high heat. (We’re not really deep frying here, but we want to get the oil quite hot as this will mean that less of it will be retained by the spring roll wrapper) 3. Assemble your hot pocket. The easiest way I’ve discovered is to turn the wrapper so that it looks like a diamond. Then spread a thin layer of the Dijon mustard on the spring roll wrapper, sparing the edges. Place your cheese (2 -3 slices, depending on the size of the cheese you’re using… I just used one circular piece of gouda, cut into halves) and about 2 -3 slices of meat on the lower half of the diamond, once again sparing the edges. You want to place enough filling so that you get a full pocket, but you need to be able to fold the top portion over and seal the edges, so use that as your guide. Fold the top half of the diamond down, and smear thin the flour/water paste along the edge of the bottom half of the diamond. Press down along the edges, so that you now have a triangle in which your filling is encased. 4. Once oil is hot, place your pockets in the pan (don’t overcrowd the pan as this will drop the temperature in the pan) you may only be able to do one at a town), and fry until golden brown. Flip and do the same to the other side. (About 1 minute per side) Remove cooked pockets to a plate with paper towel on it to remove excess oil. You guys, this may be a white trash meal, but it was really yummy! Something delightful happens to Dijon mustard when you warm it up, and although the pictures don’t really show this, each mouthful of pocket was a wonderful combination of this mustard mixed with gooey cheese and tender turkey meat. This would be great for a snack, lunch, or even a light dinner (Tony & I each had 1.5 pockets, and we totally satisfied). The thing that takes the most time is assembling the pockets, but all together you’re looking at a 15-minute meal, tops. They're a fun meal, and they're also really easy and cheap to assemble, which makes them a clear winner in my cook book. There's lots of gooey cheese in there, I swear! For interesting variants, I could see using pesto instead of mustard, or even trying to modify this to a breakfast purpose and adding in eggs and bacon. I might also try to do a “pizza/calzone” version in the future and see how that goes. This little experiment was so successful that I was certain to pick up some more wrappers at the grocery store last night, as I definitely predict there will be more of these little beauties in our future (and hopefully in yours, too!). I will have to share the recipe for samosas with you at a later date, now that I’m more comfortable with my wrapper folding technique. The wrappers are pretty inexpensive (about $3, and you get something like 15 in a package), so I’d highly recommend you try this out. 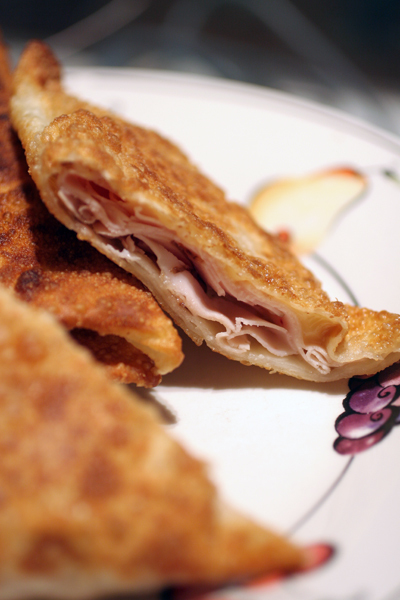 You could even make these in bulk, because Tony told me that they reheat quite well in the toaster oven (or in a regular oven, even) the next day, OR you can even assemble the pockets and freeze the ones you don’t want to cook right then, and simply defrost them in the future and cook on demand. Again, whatever is easiest for you (it’s all about you… 😉 ). I toyed with the possibility of trying to make this a lower-fat version (though really, if you’re just eating one or two, they’re not really THAT bad for you), by brushing the pockets with oil and then baking them, but I really don’t know whether spring roll pastries respond well to the oven on a first pass. So I decided to instead go with a fool proof approach and fry them per the instructions, but if you’ve experimented with other cooking techniques, please let me know! I’m going to have that Hot Pocket jingle in my head all night now! I am sorry to say I have subjected myself (long ago) to the Hot Pocket, the Lean Pocket, and their evil pre-cursor, Totino’s pizza rolls. Oh yes. Your homemade version sounds much, much better! Yes, after posting this clip, I had that jingle in my head for the rest of the day. The thing about Jim Gaffigan is that no matter how many times I see his schtick, I always giggle uncontrollably. I remember eating pizza rolls in middle school, but they were from the school cafe, and were more like wonton/spring rolls rather than a doughy calzone. But I’m sure they were just as bad for me as the frozen variety that you DIY in the microwave. These look amazing! I like the idea of trying them with a smoked cheese.I have been eating a lot of that lately. I think I would also try mine with turkey. Also, these look bit like the fried tortillas that my step-mother made me at Christmas. They were just plain tortillas fried in oil and sprinkled with powdered sugar, but she served them as a type of cookie, and they were really good. 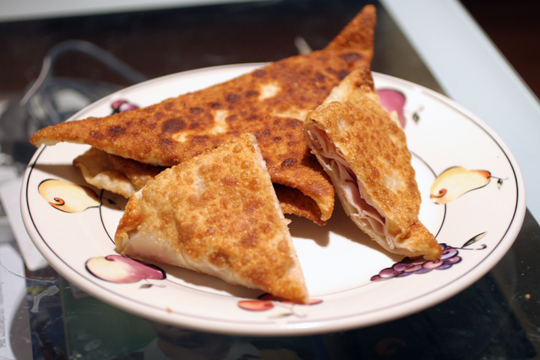 In a way, these are quite similar to quesadillas, which I make using flour tortillas, but there is something to be said about forming a pocket shape! I could see how doing a sweet twist on a tortilla would be really good!